It's been a while since I’ve been in touch. Quite frankly it has taken me some time to recover enough from all of what has happened to our community before feeling able to write a blog post. 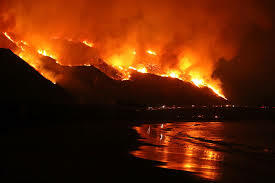 The Thomas Fire last December was the largest fire in the recorded history of California and right in our backyard... It was frightening! It was the Thomas Fire that created the conditions for and was followed shortly thereafter by the Montecito mudflow. Our very own personal disasters in time for Christmas and News Years. The breadth of the areas affected by the mudflow are so much greater than what the photos show it’s been hard to 'wrap my head around it'. A swath of homes, building, roads, bridges and trees were destroyed as a path of gigantic boulders, earth, debris, and more than 9 million gallons of water surged from the mountains all the way to the ocean. Covering an area at least 5 blocks wide and wider in some places. It's difficult to take in the magnitude of this occurrence. For many writing is cathartic and perhaps that's what I'm doing a little of now. It just didn't feel 'right' to pop back in and talk about how wonderful the Goathill Faire was last weekend without this post as preface. With a humble and a grateful heart, I can say thank goodness my family survived unscathed, which was not the case for so many others. They will be digging out from this disaster for a long time some say 2 - 3 years. And it will take many more years if ever to heal from the loss of loved ones. My heart goes out to all the people of Hawaii who are now being similarly affected by the Kilauea volcano.